When buying a diamond the greatest price discrepancies are related to the diamond certification. Labs do not all grade diamonds with the same criteria. I have sent diamonds that have been EGL USA certified to EGL SA and the grade has changed by 5 grades. A G Vs2 EGLUSA has come back from GIA with a grade of J si2. This change in grade affects the price by 40%. If you do ever get an EGL certification that is not EGL South Africa I would recommend sending it to EGL SA to be tested.You will be shocked with what you will find! Gia is the global standard.They are the lab that invented the 4 C's.They are a non profit organization serving the jewellery industry.If you bye a Gia certified diamond you can be sure your investment is safe. 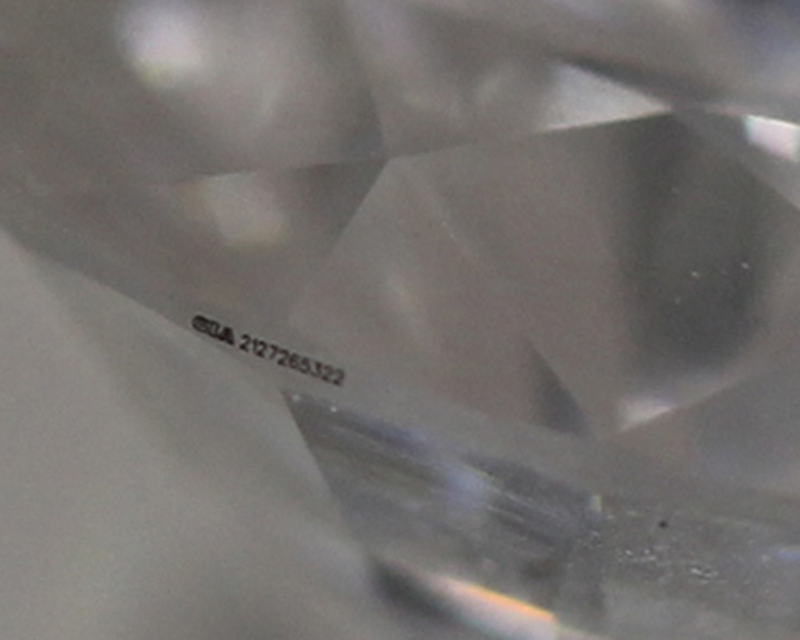 All Gia certified diamonds have a laser inscribed serial number on the side. (See the picture)This number is found on the certificate and can be found on the Gia website. Remember there are no laws governing diamond certification. I could grade a k colour diamond a D colour if I wanted. When selecting you diamond the first desition is what certification you want.If you do not specify a lot of jewellers will try sell you a diamond that looks good on paper. Take time Look at different certified diamonds and decide which diamond looks the best. Line all the diamonds up and look at them under magnification to see all the flaws. Never bye a diamond that you have not seen unless you really trust the source. Most diamonds are billions of years old-Your diamond will find you. Everyone is always looking for the best diamond price and little consideration is taken with regard to who or how the diamond engagement ring will be made. Diamonds have a controlled market price.Engagement rings vary in quality from jeweller to jeweller. There are very few jewellers who can make top quality diamond engagement rings. 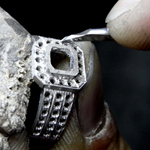 Platinum rings and palladium rings should always be handmade as cast rings display porosity. In Cape Town there are but a handful of goldsmiths who can work in platinum. In fact if an engagement ring is made by one of them the others can recognise the style and workmanship.All goldsmiths have there individual way of doing things. These techniques are passed down from master to student. Today there are only very few goldsmiths producing custom hand made diamond rings. Cast rings are mass produced by large casting factories and generally there product is less expensive and involves unskilled labour. Often cast rings do not last and stones fall out.These cast rings have very little character and style. Think of the craftsmanship in a great marble statue carved by Michaelangelo.Today there are laser machines that can duplicate his statue of David. What is the value of a reproduction?It is a little more valuable than the marble it is carved from. Handmade craftsmanship holds a value and in fact as the numbers of goldsmiths decline due to mass production and cheep imports the ones that are highly skilled are valued more. Remember an engagement ring should last a lifetime. Choose a handmade diamond ring.